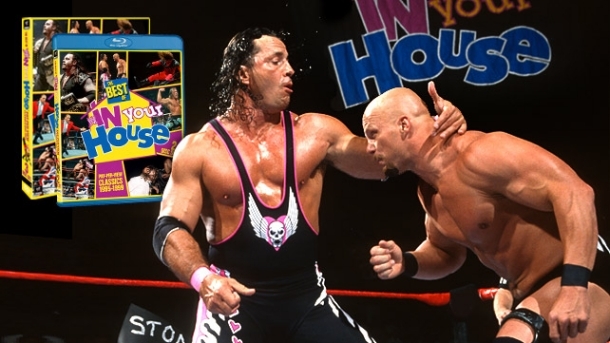 If you have not yet got your hands on a copy of The Best of In Your House, check out the intro video below, which comes courtesy of WWEDVD.co.uk. This is but a small preview, as the full DVD runs for over 7 hours and the Blu-ray edition has 1 hour and 27 minutes of exclusive footage on top! Click here to get your copy on DVD or Blu-ray right now in the United States. “Best of In Your House” is also available now at Amazon Canada and Shock Australia. The UK and Europe will get it on May 27th when pre-ordering now with WWEDVD.co.uk. The next WWE DVD and Blu-ray release is WrestleMania 29 on May 14th. As we’ve mentioned, you can pre-order exclusive packages at WWEShop which include bundles with the event program or the event T-Shirt. Click here or the promo image below to get yours. A number of WWEDVDNews readers let us know that they’ve found the WWE 2005 PPV DVD box set on special offer at FYE stores for $49.99. Be on the look out for that deal. We have a new and improved WWEDVDNews mobile site active and live now. We hope you enjoy using it when you need your news fix on the go!